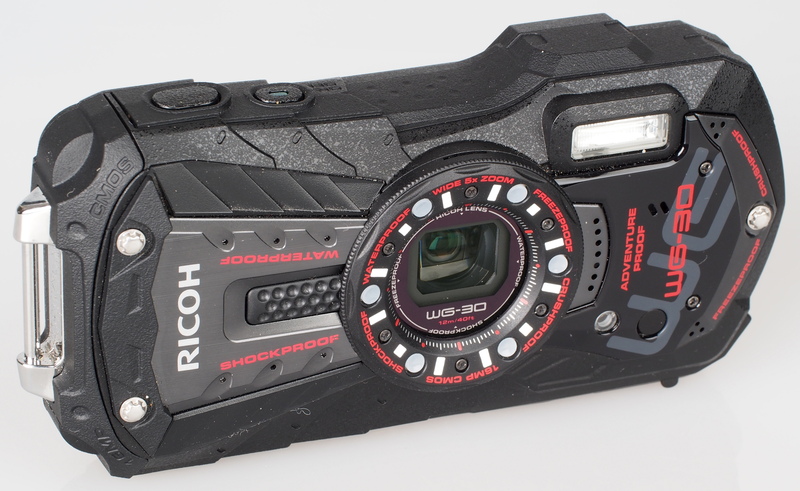 Reviewed, the tough Ricoh WG-30, waterproof compact camera with fullHD video recording. The Ricoh WG-30 features a wide-angle 5x optical zoom lens equivalent to 28mm to 140mm in 35mm terms. The camera uses digital shake reduction rather than optical, and has a built-in flash for low-light situations, as well as 6 LED macro lights around the lens for close-up photos. The camera comes with a macro ring to let you place the camera directly onto flat surfaces. When shooting there is auto picture mode which automatically selects the best camera settings for the detected scene. There are a number of other scene modes such as HDR, digital microscope, time lapse and more. When you've finished shooting you can edit your pictures in playback using a range of filters. 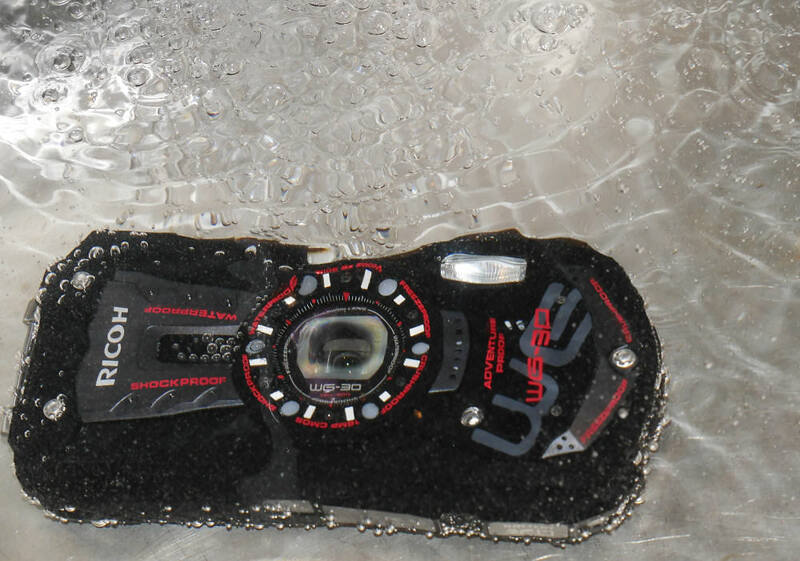 The WG-30 is waterproof to 12m, shock resistant to 1.5m, freeze-proof to –10°C, crush-proof, and dust-proof. Videos are recorded in full 1080p HD at 30 fps, and you can also record high-speed videos at 120fps. The WG-30 can be connected to a HDTV for playback via HDMI. The Ricoh WG-30 has adopted the more chunky styling of its bigger brother, the WG-4, and as a result there is plenty to grip on to. 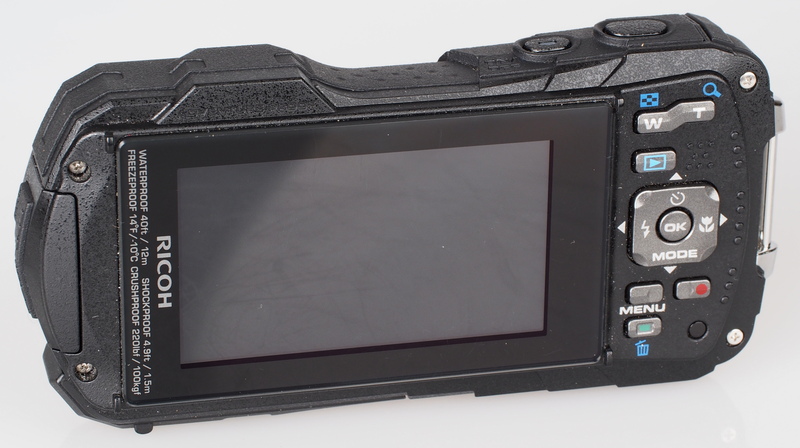 The buttons on the back of the camera are fairly close to each other, and if you have big clumsy hands then you may have some difficulty with them, but for the most part there were no problems using the camera. On the back are a number of raised dots to give good grip for your thumb, and a large metal strap loop makes it easy to attach the wrist strap. 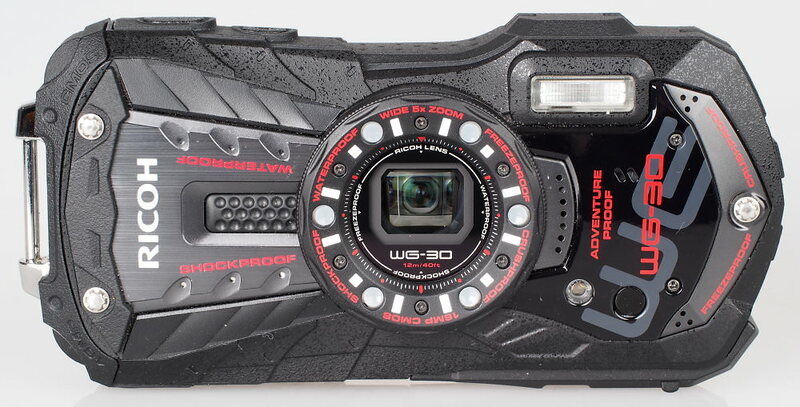 The camera feels tough, as you would expect for a drop and crushproof camera. Menus – The menus are quite easy to use, and when switching modes the camera gives a brief explanation of each mode. Built in help for the menu options would make the camera even easier to use. 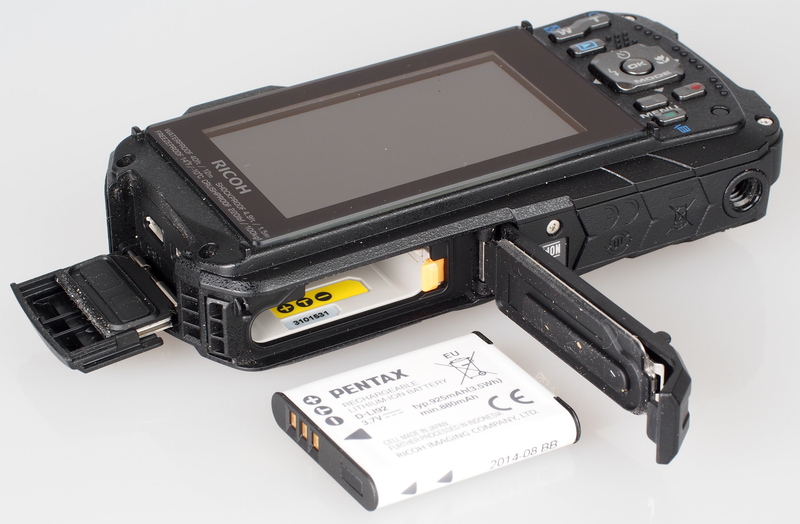 Wi-Fi features can be found on the WG-30W version of this camera, giving you the option for remote shooting, as well as downloading and viewing images. Shutter response, and focus speeds are quick, and shot to shot time is reasonably good. Continuous shooting at full resolution is a little slow at just under 2fps. Sample Photos - The camera has reliable exposure, and will produce images with bright saturated colours in most situations. Portrait photos with flash often increase the ISO setting, and in this example using ISO1600 has created an image with very low detail and a blurry image with poor colour. Lens Performance - Image quality is somewhat disappointing, with images appearing soft, showing chromatic aberrations, and suffering from vignetting. Macro performance is a strength of the camera, although noise is visible at all ISO settings. The lack of image stabilisation and a fairly slow lens will limit the camera's low light performance. Images should be suitable for sharing on social media websites, where the reduced resolution, and bright colours will help. White Balance Performance - Auto White Balance (AWB) gives a yellow / warm colour cast under tungsten lighting, with the tungsten preset giving an accurate result. AWB performs very well under fluorescent lights, with the fluorescent preset giving a slightly warm result. Digital Filters - Scene modes / Digital Filters / Effects / plus HDR / Dynamic range mode examples. Very few effects are available when shooting, and instead there are a large number of effects available in playback mode. Options include: Small face filter, Collage, HDR, Original frame, as well as further examples above. Video - The camera records full HD video at 30fps, or 1280x720 video at 60fps. Unfortunately, optical zoom is not available while recording video. Slow motion video is also available, an example can be found here. 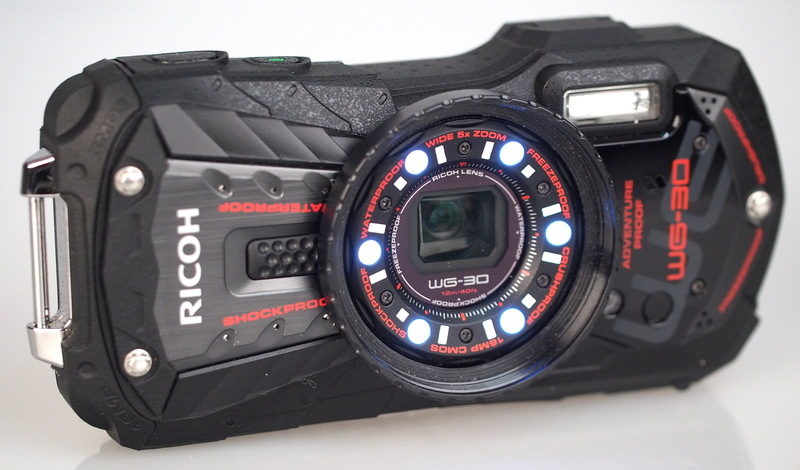 The Ricoh WG-30 is a tough waterproof camera, with a number of useful features, most noticeably, the unique macro LED lights that surround the lens. However, the camera gives images with high levels of noise, and fairly low levels of detail, and whilst this is fairly typical for this class of camera, the lack of image stabilisation (OIS) as well as the inability to use optical zoom while recording video puts it at a disadvantage compared to the competition. 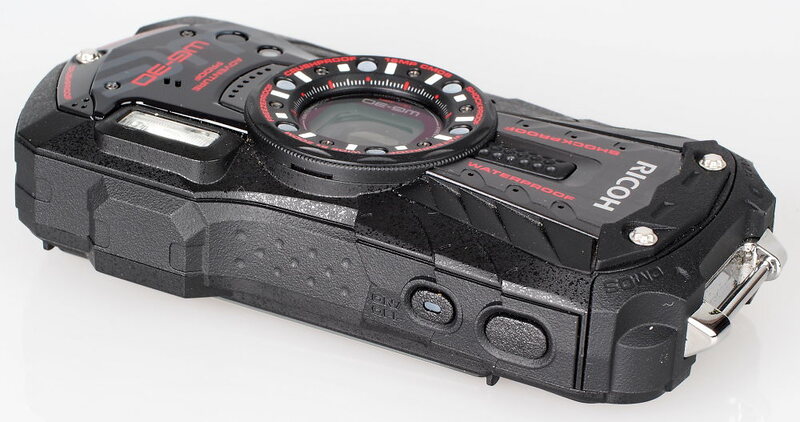 If the price of the WG-30 were to drop over time, then this camera may be worth looking at, particularly if you just wanted to share images to social media websites. Worst possible experience for me. Bought in Italy to take pictures underwater during my honeymoon , followed the instructions carefully and after few minutes less than a meter underwater the camera started to have strange problems like buttons not responding and steamy screen. After having dried the camera (as per instructions) i tested the battery inside and the memory card , and they were working fine. The camera turned to be unusable for the whole duration of the honeymoon. But the fun part comes now, i actually have the camera still on warranty and the shop i purchased it from (MediaWorld) sent it to the Ricoh Italian Assistance for repair, guess what... they returned the camera still broken writing that the watertight was working so they guessed it was my fault, this means no warranty.... so basically if the camera is faulty like mine they will rather tell a customer it's his fault and it is the customer word against their, so basically i got scammed . There are a lot of good and honest camera companies but RICOH doesn't seem one of those. If you want a camera to take pictures under sea water i strongly suggest you not to buy this camera for the warranty scam.